NETWORK FINALS: THE VOICE gained 0.1 in final numbers, while BLINDSPOT lost 0.1 for a series low 1.3. In addition, CASTLE lost its 0.1 bump, and both the 8PM BIG BANG THEORY rerun and the GOTHAM rerun were also down 0.1. CABLE HIGHLIGHTS: The NCAA CHAMPIONSHIP GAME moved from CBS to cable for the first time, and fell steeply, even with multiple-network coverage counted. The 2015 game was at 9.1, while this year’s game scored 4.52 for the regular telecast on TBS, plus 1.07 on TNT and 0.31 on Tru for North Carolina and Villanova-slanted coverage for a 5.90 total, still down by over one-third. (NOTE: SKEDBALL has a more detailed analysis of the NCAA TOURNAMENT ratings.) The basketball didn’t hurt USA’s WWE at all–in fact, it was up to 1.60/1.56/1.48 from last week’s 1.36/1.35/1.34. On VH1, LOVE & HIP-HOP switched to its Atlanta mode, and rose 0.13 to 1.49, with BLACK INK CREW returning at 1.21. MTV’s TEEN MOM fell 0.15 to 0.88, with the post-show down 0.12 to 0.48. AMC’s BETTER CALL SAUL added 0.03 for 0.81. 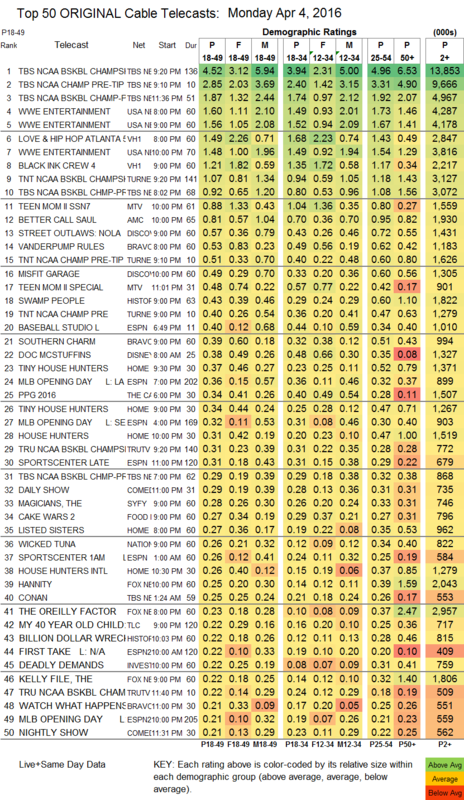 On Discovery, STREET OUTLAWS fell 0.17 to 0.57, and MISFIT GARAGE lost 0.03 to 0.49. Bravo’s VANDERPUMP RULES dropped 0.18 to 0.53, and lead-out SOUTHERN CHARM was at 0.39. On History, SWAMP PEOPLE edged up 0.02 to 0.43, and BILLION DOLLAR WRECK was down 0.07 to 0.22. 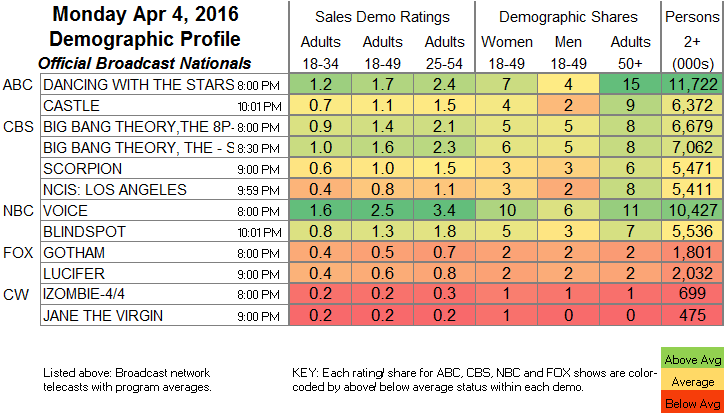 Syfy’s THE MAGICIANS was steady at 0.28, and BITTEN ticked up to 0.08. Food Network’s CAKE WARS rose 0.04 to 0.27. TLC’s MY 40-YEAR OLD CHILD was at 0.22. A&E’s DAMIEN aired without a BATES MOTEL lead-in, and fell 0.05 to 0.12. Logo’s RUPAUL’S DRAG RACE gained 0.03 to 0.15.